It’s a monumental day in Aaron Miles’ Fastball history. 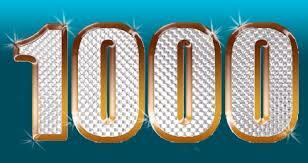 This is our 1,000th post since the site began on Jan. 5, 2011. First off, thanks to each of you for reading. It’s very much appreciated. Without you, sharing our thoughts on the St. Louis Cardinals isn’t nearly as enjoyable. And we like hearing your thoughts as well — posts that generate discussion are always good. Looking back, it’s been quite a ride over the past 26 months. Ah, yes, the World Series … September and October 2011 were months to remember for sure. We chronicled the thrill of the Cardinals comeback throughout the daily ups (walk-off wild pitch!) and downs — and sometimes received unexpectedly exciting attention for it. We know that things continued to go exactly as they needed to, of course, which brought us to October — and to the launch of David Freese, postseason hero. 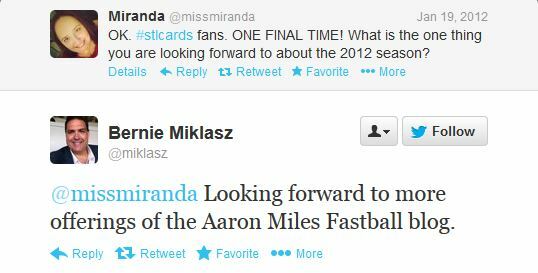 Just before the World Series began, Miranda shared her thoughts on Mr. Freese in a love letter. Better than nothing, right? Although I tried my best to get Andrew McCutchen to respond to the love letter I wrote him — obviously to no avail. But we did hear from our site’s namesake when he joined Twitter last summer. Just in case you’ve put out of your mind that horrible Dodgers-Cardinals series just before things turned around in August 2011, here’s what Aaron is referring to. As mentioned above, Tara’s love letter to Jon Jay and his subsequent retweet brought about our highest traffic day at AMF. It also was one of our most popular posts. Ahead of it: the provocatively titled “Nick Punto Gets Naked” from Sept. 10, 2011. Which leads into something we’ve learned thanks to Google Analytics: searches for Cardinals players either shirtless or naked have brought much, much traffic to AMF over the past 26 months. You might be surprised as to what’s been the most viewed, and also most searched for item, that’s brought people to the site. 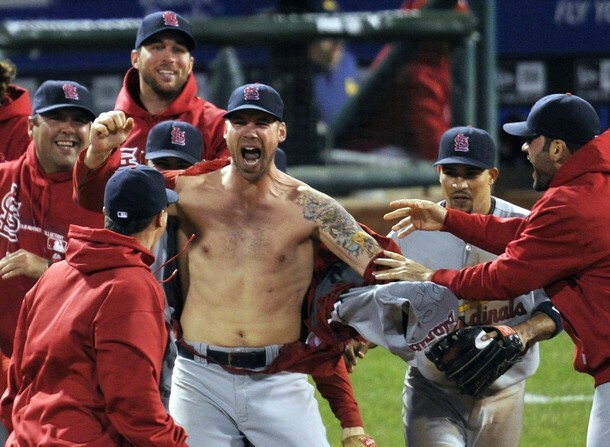 It’s “shirtless Chris Carpenter.” Now, granted, we do have two pictures of CC (mostly) shirtless — this one being the best (in my biased opinion, of course). 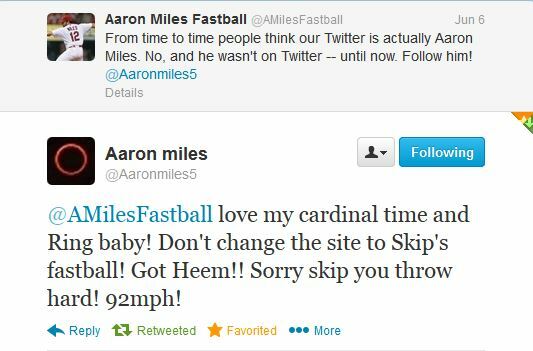 But, there you go — that is what’s brought more search traffic to Aaron Miles’ Fastball than anything else. Not that I’m complaining … although I do continue to thank Nick Punto every time I see this. Some of those just make me cringe … And to the person who is looking for Craig Kimbrel shirtless and naked on a Cardinals blog, the best of luck to you. After those lists, there’s probably nothing left to say for post 1,000 — right? Other than to once again say thank you for your support and for reading. On behalf of Tara and Miranda, we sincerely appreciate it. Now on to 1,000 more — and World Championship No. 12! No searches for a naked Matt Adams? If you’ll excuse me, Amy needs to correct that oversight and go visit Google now. Congrats on hitting this mark, and in just over two years! That’s incredible and it’s been a fun ride so far. Keep it up!